One imperative—to make also highest the lowest on the so-called food chain—the microbes and maggots atop that discompose the corpse. This is a big fat post because wordpress doesn’t wish to import my very first early tumblr posts. So I’m piling ’em in here. Maybe I should just let it go but I’m not good at that. This blog, and rotting things generally, cuz I’m not, here come to teach me. Archaeologists unearthing clay tablets (Gilgamesh) and mummies wrapped in strips of recycled papyrus (Sappho) have developed a robust minor vocabulary for what’s gone missing. Ellipses. Italics. Round brackets, square brackets, curly brackets, angle brackets, half square brackets. Each to mark a different sort of goneness. Armand Schwerner had some fun with that vocabulary and in the process turned marks of absences to presences in their own right. This page from his Tablets takes it to one extreme. Spring . . . . . . .
Too long . . . . . .
Gongula . . . . . .
What I’ve been reading here. 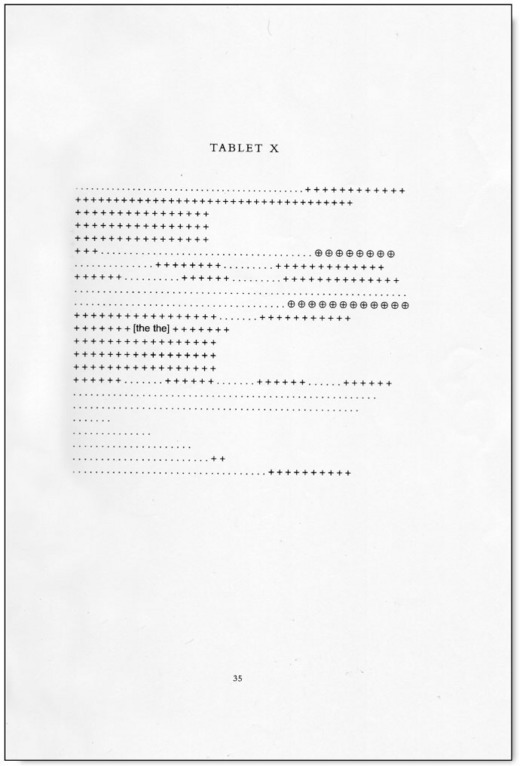 Armand Schwerner, The Tablets. Sappho, If Not, Winter (Anne Carson trans.). James B. Pritchard (ed. 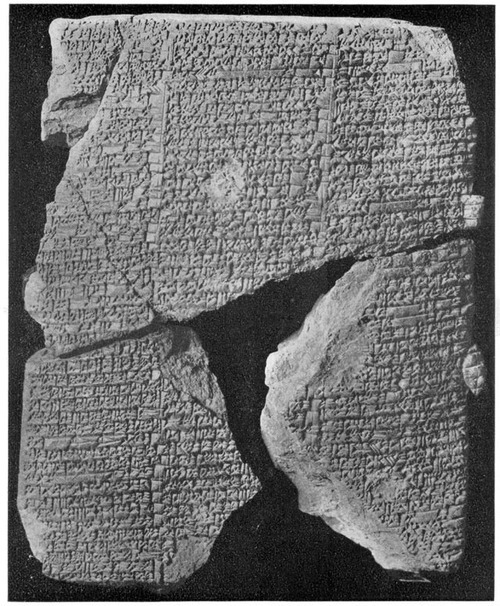 ), The Ancient Near East: An Anthology of Texts and Pictures. Here’s a bit of Gilgamesh for ya. G’night. The Bible is a huge gorgeous reeking compost pile. Take Genesis. Three or more authors have their hands in it. The earliest is known as J, the Yahwist, and his God is fierce, dangerous, fallible, embodied. He likes to walk in the shade on a hot day. Then there’s P, the Priestly writer, his God’s detached and magisterial, his words are pure act, no dirtying of the hands, just let there be light. And E, the Elohist, his name for God Elohim, inconveniently plural. Drawing it all together, somewhat skilled and somewhat hapless, R, the Redactor, trying to get a coherent account out of it all. He could cut and paste but couldn’t alter much the texts he received as sacred. He succeeded insofar as we have a single thing called “The Bible.” He failed gorgeously insofar as we have two overlapping Creation accounts, glaring contradictions in the story of the Flood, and not one, not two, but three iterations of the “Hey, Pharaoh, that’s no sister, that’s my wife” gag. Writings are readings. Readings are restlessly multiple. Thank God for which. What I’ve been reading here. R. Crumb, The Book of Genesis Illustrated. David Rosenberg and Harold Bloom, The Book of J. Stephen Mitchell, Genesis. Lastly, the beauty, to this atheist, of two thoughts in Genesis. That the created is good. And that even omnipotent beings come to rest. So I’m starting to think about a course called “The Art of Compost” I’m set to teach this summer. And I thought, why not a blog, work out some ideas there. The recovery of the compost library extends in all directions.